WASHINGTON, D.C. – Ophelia Adams Little was born on September 24, 1923, in Edgefield, S.C., to the late Johnnie Jasper Adams and Minnie Lee Mitchell Adams. She was the second oldest of 13 children. Mrs. Ophelia Little came to Washington, D.C., in the early 1950s where she worked at the Latch String Cafeteria. There she met her future husband, Mr. Rufus Little, Sr. The two were ultimately joined in Holy Matrimony. From this union they were blessed with 3 children, Rufus Little, Jr., Eloise L. Morrisey and Janice Gast. She was preceded in death by her husband Rufus, January 7, 1981, and her daughter, Janice, January 27, 2011. Ophelia left the work force in 1954 to become a homemaker and care for her husband and 3 children. She also cared for her 3 grandchildren, Stephanie, William (Billy) and Christina whom she cherished. Ophelia briefly returned to the workforce as a teacher’s aide at Marie Reed Learning Center. She was well liked and respected by the faculty, staff and students. Ophelia loved to sew and was an avid seamstress. She won many awards while attending sewing classes. She loved to bake and cook delicious meals for her family. Family was very important to her and she was very involced in the lives of her children and grandchildren. She ensured the family was a close knit unit and made holiday gatherings vital. Ophelia loved the Lord. She loved reading her Daily Word and the Bible. 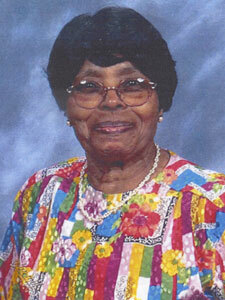 She attended church regularly and had been a member of Meridian Hill Baptist Church for many years. She loved to walk to church on Sundays and began riding the church can when the church moved to Maryland and combined with Cathedral of Christ Baptist Church. Ophelia touched all our lives in a special way and we are blessed with loving memories of her in each of our lives. She leaves to cherish her memories her son Rufus Little, Jr., (Cynthia) and her daughter, Eloise L. Morrisey. Three grandchildren Stephanie RaShawn (Eloise), William Brian and Christian Janelle (Janice), her sisters Beatrice Mance, Sophie Johnston, Johnnie Lou Yeldell, Earline Scurry, Rosa Lee Mosley and Pernell Ray of South Carolina and a brother Willie H. Adams of Washington, D.C., and a host of loving relatives and friends. She will be missed more than she will ever know. Interment was at Lincoln Memorial cemetery at Suitland, Maryland. The family wishes to express their deep appreciation for the many comforting expressions of love and sympathy extended during out time of bereavement. Your thoughtfulness means so much to each of us.